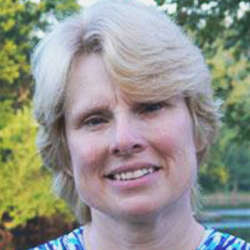 Dr. Catherine Pittman continues her series on antianxiety medication by explaining how selective serotonin reuptake inhibitors work. Treating anxiety can be done with or without medication. But finding the right medication can be difficult. Each one is different, and affects each individual differently. 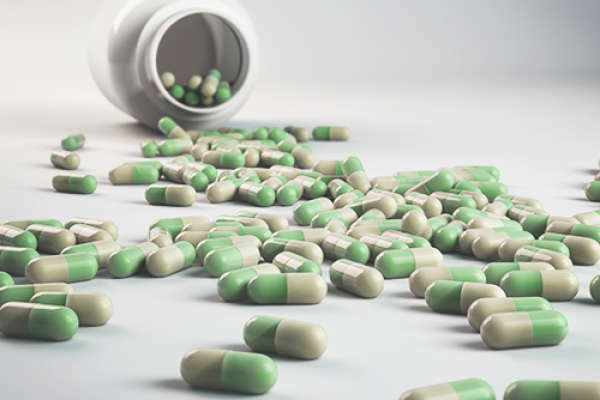 Before you commit to a medication, educate yourself on what exactly is entering your system. Essentially, SSRIs increase serotonin in the brain. Neural systems affected by increased serotonin regulate mood, sleep, appetite, and digestion. Not surprisingly, the first drugs designed to affect serotonin levels often caused side effects of drowsiness, weight gain, and nausea. 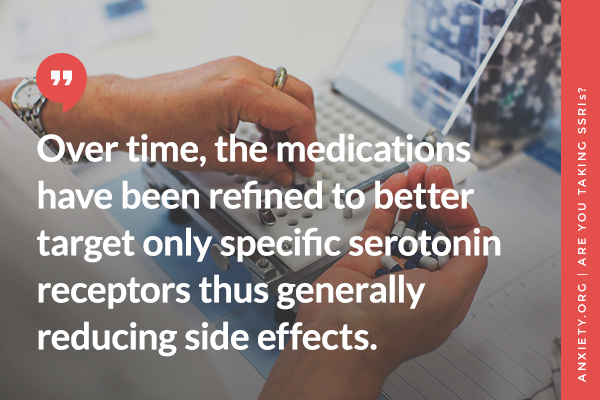 Over time, the medications have been refined to better target only specific serotonin receptors (and thus are called selective serotonin reuptake inhibitors). As newer medications are put into the market—first Prozac, then Celexa, now Lexapro—each generation becomes more and more selective in terms of serotonin receptors targeted. Accordingly, the number of side effects has generally been reduced. At first, it was thought that simply increasing levels of serotonin was responsible for reducing symptoms associated with anxiety and depression. This was consistent with the popular idea that depression resulted from a chemical imbalance of serotonin. But if the increased level of serotonin itself were responsible for the change in symptoms, the effects of increased serotonin would occur immediately, as soon as people take the medication. Instead, it usually takes a week or more for a positive change in symptoms to occur. 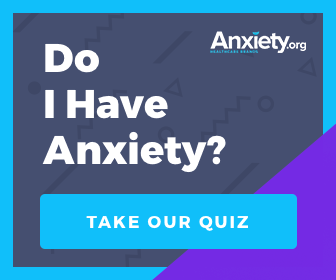 In fact, some people may experience a worsening of anxiety symptoms at first. It therefore became obvious that an increase in serotonin levels couldn't be responsible for these delayed changes, so researchers began investigating other changes in the neurons that took place in seven to fourteen days, when the medications began to ease the symptoms of anxiety. What researchers found is that daily use of SSRIs for more than a week or two eventually results in changes in the structure of neurons. This is neuroplasticity, the brain's ability to reorganize its neural connections, in action. As neurons adapt to new levels of serotonin, they make adjustments in the number of receptors, grow new dendrites, or even promote the development of new connections or circuits.1 In other words, new, higher levels of serotonin may somehow stimulate the neurons to remodel themselves and their circuits in a variety of ways, a process called neurogenesis.2 This process is currently only partially understood. For now, the most accurate way to characterize the change in these neurons is to call it increased flexibility, indicating that the neurons become more capable of modification.Thus, SSRIs are thought to increase the brain's ability to restructure parts of itself, making it more amenable to changes and new learning. This increased flexibility, or neuroplasticity, does not necessarily mean that anxiety will decrease. What it means is that your brain is more capable of making changes that will lead to a decrease in anxiety. 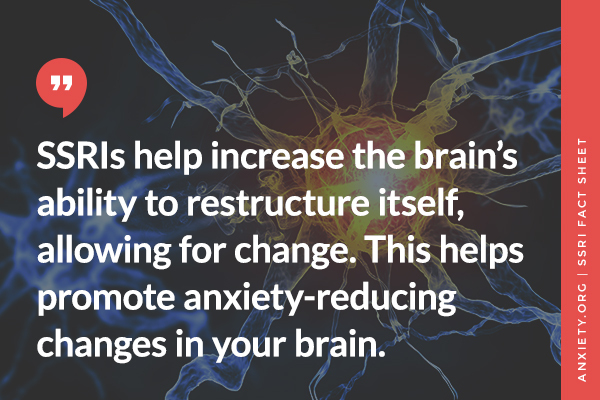 You still need to know what to do to promote anxiety-reducing changes in your brain. Monitoring and changing anxiety-producing thoughts is one way to make changes that will reduce anxiety. Another way is to learn ways to respond effectively in anxiety-provoking situations, rather than to avoid them. The SSRIs can often help a person accomplish these kinds of changes. Again, these are the most frequent side effects. Be sure to document any physical and mental changes in the course of your treatment. Communicating about these side effects with your doctor will help determine if this is the right medication for you. Often you may have other options and don't need to tolerate negative side effects. 1Eisch, Amelia J., Heather A. Cameron, Juan M. Encinas, Leslie A. Meltzer, Guo-Li Ming, and Linda S. Overstreet-Wadiche. "Adult neurogenesis, mental health, and mental illness: hope or hype?." The Journal of Neuroscience 28, no. 46 (2008): 11785-11791. 2Petrik, David, Diane C. Lagace, and Amelia J. Eisch. "The neurogenesis hypothesis of affective and anxiety disorders: are we mistaking the scaffolding for the building?." Neuropharmacology 62, no. 1 (2012): 21-34.